Offering you a complete choice of products which include artistic bollywood designer saree, bollywood designers party wear sarees, bridal lehenga stone work silk designer sarees, bridal wear lehenga heavy stone work designer sarees, lehenga heavy stone work partywear designer sarees and lehenga heavy work partywear designer sarees. We are the leading exporter, distributor, supplier, seller and dealer of Unique Designer Sarees in Chennai,We are offering an attractive superb color combination of Indian Designer Sarees which enhances the look and the charm of wearer. We are highly praised for the intricate design and light weight of these Indian Designer Sarees.Our patrons highly praise our collection for its fabulous attributes like contemporary styles, colorfastness and light weight. These designer sarees are basically for formal occasions, parties, weddings and marriages. We are highly praised for the intricate design and light weight of these Indian Designer Sarees. Our patrons highly praise our collection for its fabulous attributes like contemporary styles, colorfastness and light weight. We offer a wide range of beautiful designer sarees, which come in vibrant colours, varied sizes, designs and patterns.Our patrons highly praise our collection for its fabulous attributes like contemporary styles, colorfastness and light weight. We are offering an attractive and stylish gamut of Designer Sarees. These Indian Designer Sarees are the perfect blend of tradition and trend. The superb color combination of these Indian Designer Sarees enhances the look and the charm of wearer. We are highly praised for the intricate design and light weight of these Indian Designer Sarees.Our patrons highly praise our collection for its fabulous attributes like contemporary styles, colorfastness and light weight. 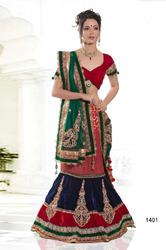 We offer a wide array of Designer Saree Prints in different colors and Patterns to our Customers. Our artistic designers utilize supreme grade fabrics in the designing and stitching processes of these products. The superb color combination of these Indian Designer Sarees enhances the look and the charm of wearer. We are highly praised for the intricate design and light weight of these Indian Designer Sarees.Our patrons highly praise our collection for its fabulous attributes like contemporary styles, colorfastness and light weight. The offered Exclusive Designer Semi Stitch Lehenga Sarees is designed using superior quality fabric and progressive technology at our well established manufacturing unit. Our designers pay great attention to details like latest fashion and stitching that provides a fault less collection. Our offered lehanga is highly appreciated among our clients due to its attractive design and optimum finish. We are one of the leading manufacturer, supplier, and exporter of wide range of a Georgette Bollywood Designer Sarees. We offers an exquisite range of Bollywood Sarees, designed using quality natural fabrics. 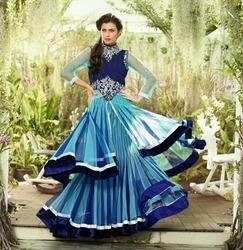 These are specially stitched keeping in mind the latest bollywood fashion trend. The fascinating georgette embroidery done with mirror, sequin, lace, bead and other embellishment imparts a elegant look. spectacular dark megenta and sea green color saree is invented on net with glowing sequins work and embroidered patch border. We are preferred amidst our competitors, as our range comes with attractive mirror, sequin, lace, bead and other embellishments that give a mesmerizing look to the wearer. These sarees reveal the feminine beauty, while making the wearer cynosure of all eyes. .
We are one of the leading manufacturer, supplier, and exporter of wide range of a Bollywood Net Designer Sarees. If you are looking to update your wardrobe with something fashionable and attractive then go for this Baby pink net saree with amazing Lace border. Entire saree is beautified with blooming sequins, jari, stones, resham embroidered floral creeper motifs and butties are represent royalty in itself. All over scattered floral motifs will give this a true beauty. Outfit is an expression of good taste and personal style. Looking for “Muga Silk Saree”?